I don’t believe any long term forecast/prediction (or projection a la IPCC). What is the uncertainty? We will see. When this warm period ends then we will either return to ice age or warm to ‘normal’ earth temperature ranges. A cursory look at the paper seems to indicate that the authors did some sort of curve fitting, but did not “hold out” a chunk of data for validation. If so, that is not good enough. The basic notion, that El Ninos and La Ninas (or whatever process CAUSES them) has an effect of making semi-permanent “step-changes” up and down in series like UAH’s global brightness temperatures; and that the accumulation of these step-changes is the explanation of apparent trends – well that is an old and interesting idea. To my eye, the strong El Ninos of 1998 and 2016 each gave an upward shift of 0.2 C and the La Nina around 2010 gave a downward shift of 0.1 C. And that is the + 0.3 C since 1990. If they have mined the data for cycles, and not kept half back for validation, you can safely say that the conclusion is erroneous at best. One wild guess is as good as any other. I would love it to be true – and frankly have long actually expected it as a “Gaian” convinced by the ability of the Earth to correct its errors. So next come the “rubbishing” and maybe sacking of these Philistines then the excuses. No resignations or apologies of course. Then we poor peasants have to start paying for correcting all the mistakes of the last three decades. 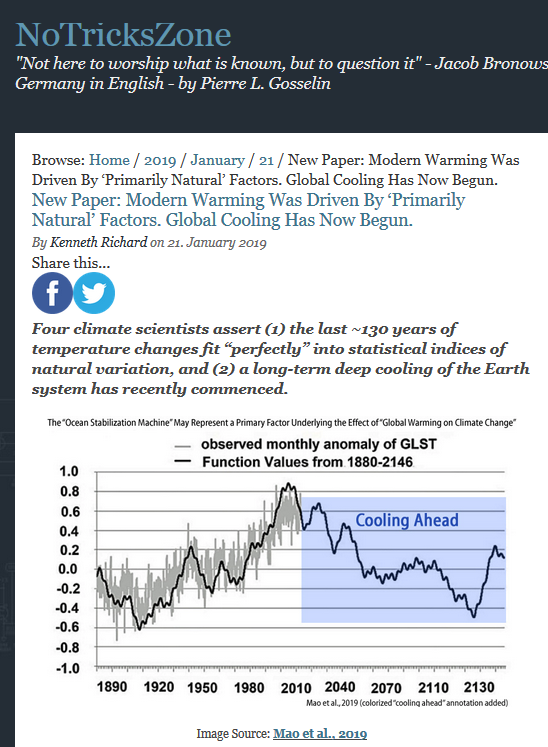 Tragically, it seems that in order to disprove alarmists claims we sceptics must hope for just what we don’t want, global cooling into another ice age. What we really need is for the planet to burst through the 1.5C IPCC ceiling asap and for nothing to happen, as we well know nothing extraordinary would happen. I’d rather not see our descendants suffer an ice age. According to another Al Gore, Bernie Sanders “look-alike”, Ms. Ocasio-Cortez calls climate change ‘our World War II,’ warns the world will end in 12 years. Go to your room, lock your door? It’s revolutionary. What else do you expect from Mao? I always wanted the man-made global warming story to be true, it would make life easier, and thats why i researched it. Bloody disappointed to find it was all fantasy but hoped we were nicely placed in the 600yr milancovich cycle upswing for warming. If natural cooling sets in im going to be well pissed off even if it gives Al Gore a black eye. Warm baby warm – thats what we all need!